We have listed some popular products that we do not sell because we think you should be aware of them so you can really understand all your options before you buying. We have not included any flexible wrap systems. They often market themselves as laser technology but are actually just LED or so low power that they are not in the same class as the lasers listed here. This summary does not include any products that are illegal, underpowered, over-hyped or possibly fraudulent. That includes products like the LaserTouchOne™ which has less power (1.2mW) than many laser pointers. The systems below are grouped by laser class. Under the equipment type, the following table shows if a product has a trigger point probe (TPP -which contains a single laser or a trigger point adapter) or a trigger point adapter (TPA- that uses alight pipe to focus energy from a light source). The information listed for products that we do not sell are based on our research and not guaranteed. Dental system adapted for therapy Console + Probes 10,000mW @940nm Humans 2 years ? 2 Slider is like a linear touch screen that lights up to indicate the mode as you slide your finger down the laser. 3 Internal library sets the time, pulsing and power for each condition in the library. 4 TPA: Optional Trigger Point Adapter can focus the energy down to a small point using optical plastic. 6 Class 1 lasers are a maximum of 1mW equivalent continuous power. Laser pointers are class 1 lasers. Class 1m laser are limited to less than 500mW, so class 1m can be 500 times more powerful than class 1 systems. We do not sell this product, so the price is estimated. Actual price can depend on options and discounts. 8 Superpulsed laser are specified by PEAK (or maximum power during the output spike) and not average or continuous power output like other systems. The actual delivered power is based on the on-off ratio of the pulse. 9 The output from LEDs and SLD is not the same as laser because the light qualities are much different. We typically derate the power level of a LED or SLD by about 90% to make it equivalent to a laser at pushing energy deep into the tissue. 10 Unattended System: This system is higher priced because it can be used in unattended therapy. Unlike higher-power class 4 systems that require supervision for safe use, these systems deliver a lower, safer power level so the doctor can leave the patient alone to work with other patients. For higher volume clinics with limited staff, the ROI for these machines is justified. 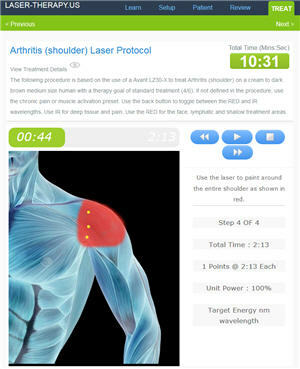 11 Many people are confused by this company because they have laser therapy in their name. This is an LED and SLD product with an optional 200mW single diode laser that can be added to the system. Their core technology is NOT laser, so we are listing them in the lowest power group. 12 According to a laser manufacturer "Laser light at 1350 nm is also rapidly absorbed by water." This is way outside the therapeutic window, so this wavelength is very inefficient. 13 These are some insane power levels. We do not recommend this type of system systems except for highly skilled practitioners who treat over 100 patients a day." In general, we believe that LED, SLD and other non-coherent light systems deliver a tiny percentage of the USABLE light energy that we see in lasers but they are doing the same function at some of the correct wavelengths. If the power level is high enough, it should be able to do the same thing. We are doing research in the area so this chart is based on that research. Here is a summary of some of the more non-coherent systems. 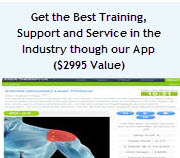 HealthLight LLC Wrap system ? Please use this table in conjunction with your home page (basic introduction to lasers), our guide to how to select a laser. and our other specialty guides ( Home Use, Chiropractic & PT & Function-Medicine, Equine, Vet & Companion Pets, Acupuncture & Trigger, Unattended Therapy, Dentistry ) to select the best system or call us at 800-388-0850.